When we first discovered that MakerBot was looking to partner with Stratasys, I was a bit non-plussed. MakerBot, as I’ve noted before, has a certain indie cred that makes this move a bit unpalatable. But, at the same time, it’s immensely important. Stratasys makes expensive, industrial-quality 3D printers. They are the “big iron” of the 3D printing world. Items printed on Stratasys hardware are as solid as anything produced by, say, injection molding, and the resolution make them indispensable for engineers and designers. In short, Stratasys is making mainframes and MakerBot is making the Apple I. While I’m loath to claim that Bre Pettis is Woz (let alone Steve Jobs), he is a charismatic leader who makes 3D printing fun, something the folks at Stratasys probably could never do. And, like Apple, MakerBot had to ramp up. 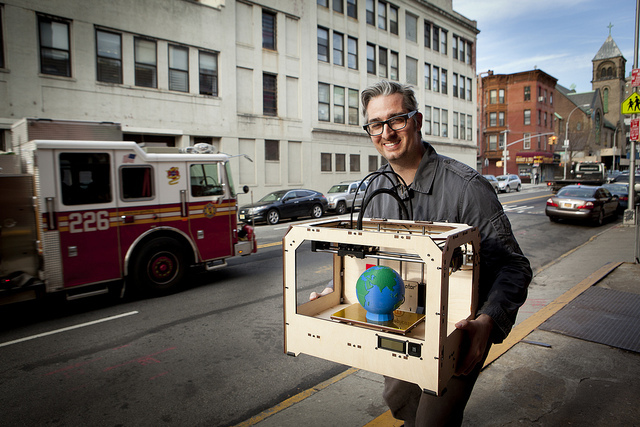 By signing with Stratasys, MakerBot will be able to maintain its breakneck speed and growth. The company recently opened a 50,000-square-foot space in Brooklyn where it is assembling machines and it has office space in downtown Brooklyn overlooking the Brooklyn Bridge. They have made it big with very little investment — they recently closed a $10 million round and were nosing around for more before this news — and they suffered from some severe growing pains along the way, especially in employee satisfaction. This purchase gives the company some breathing room, at the very least. Could MakerBot have made it without selling? Possibly, but it wouldn’t have been pretty. Home 3D printing is taking off. It’s not ubiquitous, to be sure, but it’s a method to turn bits into atoms that will become increasingly important in a post manufacturing world. Sadly, VCs are still suspicious of hardware startups (but that’s changing) and MakerBot could have gotten a few infusions of cash to help them glide to cruising altitude. Now they’re already there. Many will say that MakerBot sold out. Many will complain that the company lost open-source roots. Many will claim that there are better printers out there. None of these claims are absolutely false, to be clear, but things are not as cut and dried as we like to think. MakerBot took something simple and made it amazing. They sold when they had to, especially considering issues with quality control and support, and I trust Pettis will bring the open-source ethos to Stratasys headquarters and tell them it’s off limits. 3D printing isn’t new, just as computing wasn’t new when Apple hit the scene. MakerBot, like Apple, made it accessible.